Recently, Dr. Liu, Jinzhong, associated research fellow, and his co-researchers from the optical astronomy and astronomical applications group at Xinjiang Astronomical Observatory (XAO) joined the transiting exoplanet monitoring project and completed the observation with Wang, Songhu, 51 Pegasi b Fellow from Yale University, on the transit periodicity of classical extragalactic system Kepler-9 by using the Nanshan One-meter Wide-field Telescope (NOWT). The related work has recently been published in the Astronomical Journal (AJ, 2018, 155, 73). Kepler-9 was the first multiple-planet system discovered by using the transit method and it was also the first transit system that shows the orbital structure of transit system. Its attractive dynamic configuration, unusual planetary mass, and density became the classic sample of planet formation. The observations on Kepler-9 were limited for a long time. On the one hand, the limitation was caused by the faintness of Kepler-9 having only 14 V-magnitudes, and on the other hand, the Kepler-9b and Kepler-9c close to 2:1 orbit resonance, and they have a strong mutual gravitational interaction which led to the strong periodical changes on their transit time. Using dynamical modeling, Dr. Wang, Songhu’s research group was able to make a prediction that a transit of Kepler-9b would happen at night on 31 August 2016, which could be seen in most parts of China and hence to verify this prediction. Eight telescopes including the Nanshan Station, Xinjiang Astronomical Observatory; Xuyi Station, Purple Mountain Observatory; Xinglong Station, National Astronomical Observatories and Shandong University, Weihai displayed observation array to observe the Kepler-9. 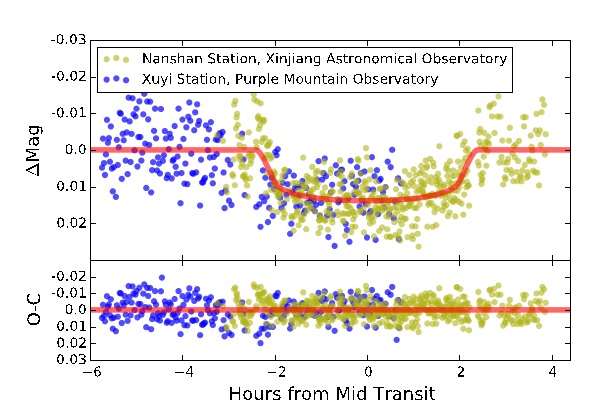 Owing to the unique location and the ideal weather in Xinjiang, the NOWT at Nanshan Station captured a complete Kepler-9b transit with the transit time in agreement to the prediction (Fig.1). This was the first transit of Kepler-9b detected by the ground base observation, and it became the basis for the follow-up study on Kepler system, measuring its orbital elements and configurations, understanding its formation and evolution history. Yang, Taozhi, PhD student, and Abudusametjan·Ekader at XAO participated in the observation and data processing under the guidance of Liu, Jinzhong. Moreover, the Nanjing University, the university of Mississippi and other related research institutes also joined this observation. Transit light curves for Kepler-9b, acquired on UT 2016 September 1 with the NOWT (yellow-green points) and NEOST (blue points) telescopes. The solid red line shows the best-fit model. The residuals of light curve from the best-fit model are plotted in the lower panel of the figure.